In the past decade, Cloud-Computing emerged as a new computing concept with a distributed nature using virtual network and systems. Many businesses rely on this technology to keep their systems running but concerns are rising about security breaches in cloud computing. Cloud providers (CPs) are taking significant measures to maintain the security and privacy of the data stored on their premises, in order to preserve the customers’ trust. Nevertheless, in certain applications, such as medical health records for example, the medical facility is responsible for preserving the privacy of the patients’ data. Although the facility can offload the overhead of storing large amounts of data by using cloud storage, relying solely on the security measures taken by the CP might not be sufficient. Any security breach at the CP’s premises does not protect the medical facility from being held accountable. 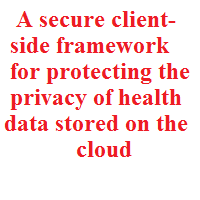 This work aims to solve this problem by presenting a secure approach for storing data on the cloud while keeping the customer in control of the security and privacy of their data.